September has finally arrived and with it crisp amber leaves, shiny acorns, shorter nights and - of course - fashion week. If you haven't already started curating your brand's Autumn Inspo 2016 board on Pinterest, now's the time. From Instagram zoom to Prada's surge in shares, it's once again been a busy week in the Ometria newsroom. And so, without further ado, here's the low-down on what's been going on in ecommerce-land this week. Happy Friday, ecommerce marketers. Have an awesome weekend! 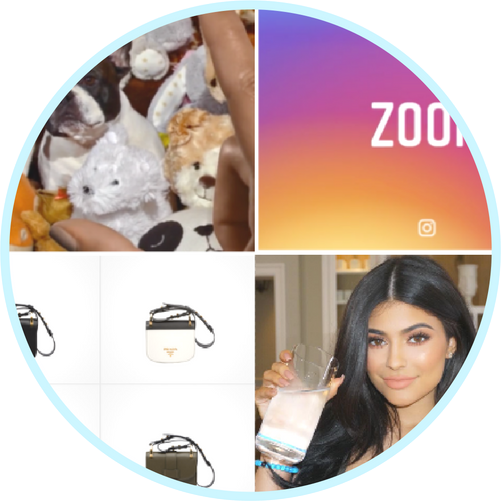 As we pointed out in a blog post earlier this week , thanks to its sponsored content, new business tools and huge following, Instagram is quickly becoming a temple for ecommerce marketers. This week, the photo-sharing social networking service unveiled yet another string to its bow - a zoom functionality. Magnifique, eh? How many times have you found yourself trying to pinch the screen of your mobile phone in an attempt to get a closer look at a photo or video on your Instagram feed (and maybe accidentally liking the photo in question in the process)? It doesn’t matter whether it’s a work colleague’s wedding dress or the floral pattern on your dream Gucci cardigan, it’s frustrating not being able to look at the detail. But those days are gone, thanks to Instagram’s new pinch-to-zoom functionality. As the name suggests, it works by pinching the screen and zooming in - exactly the same as when you zoom in on photos in your phone’s photo gallery. However, there’s a slight caveat - you can’t zoom in and sit back to have a closer look - you have to keep your fingers on the screen. When you let go, the image bounces back. Zoom is available for Instagram on iOS, and will become available on Android in the coming weeks. Ever since its ‘Buy Button’ failed to really take off, Twitter seems to have been left behind in the ever-shifting world of ecommerce marketing. And what with Instagram introducing its ‘tools for businesses’ and Snapchat announcing geofilters and italic captions, the pressure has no doubt been on. But Twitter isn’t one to let anything ruffle its feathers. Despite fierce competition, the company has announced a new button enabling people to initiate a Direct Message (DM) with a brand straight from its website. A blog post by econsultancy claims that users are given 10,000 characters in which to articulate their private comment or enquiry using the new button. Definitely beats a 140 public tweet. The button is available at: publish.twitter.com. For more information check out this article by Product Marketing Manager at Twitter, Colorado Jeff Lesser. Just how much do celebs earn through Instagram #ads? There’s been a lot of discussion surrounding influencer marketing this year - including a blog post from yours truly (on ASOS, who’s killing it). But how much do you think celebrities actually get for their Instagram adverts? According to Captiv8 - a company connecting brands to influencers - an account boasting 3-7 million followers can charge up to $75,000 per endorsement on Instagram. In an attempt to make the advertising process more transparent, social media celebs have been encouraged to use the hashtag #ad when posting sponsored content. The legalities? It's a tricky one. An article from the NY Times claims that the nonprofit truthinadvertising.org has asserted that numerous posts from the Kardashian sisters violate guidelines from the Federal Trade Commission, which say it should be clear to consumers if a person promoting a product has been paid or rewarded in some way. In a nutshell: it's complex, but important to know. Find out more here. Prada shares have risen as much as 15% following Chairman Carlo Mazzi’s announcement that the luxury brand will make a solid comeback next year thanks to cost-cutting and online expansion in Asia. Mazzi said that this year has been a “turning point” for the Italian fashion house, and that it is now “firmly on the path to sustainable growth in revenues and earnings from as early as 2017”. The brand has hitherto been reluctant to jump on the ecommerce bandwagon, and only started selling online in Europe in June.